USES: Amantadine is used to prevent or treat a certain type of flu (influenza A). If you have been infected with the flu, this medication may help make your symptoms less severe and shorten the time it will take you to get better. Taking amantadine if you have been or will be exposed to the flu may help to prevent you from getting the flu. This medication is an antiviral that is believed to work by stopping growth of the flu virus. This medication is not a vaccine. To increase the chance that you will not get the flu, it is important to get a flu shot once a year at the beginning of every flu season, if possible. Based on the recommendation from the Centers for Disease Control (CDC) in the US, amantadine should not be used to treat or prevent influenza A because the current influenza A virus in the United States and Canada is resistant to this medication. For more details, talk to your doctor or pharmacist. 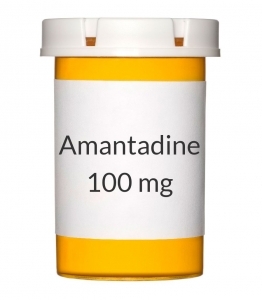 Amantadine is also used to treat Parkinson's disease, as well as side effects caused by drugs (e.g., drug-induced extrapyramidal symptoms), chemicals, other medical conditions. In these cases, this medication may help to improve your range of motion and ability to exercise. For the treatment of these conditions, amantadine is believed to work by restoring the balance of natural chemicals (neurotransmitters) in the brain. HOW TO USE: Take this medication by mouth with or without food, usually once or twice daily or as directed by your doctor. If you are taking this medication twice a day and have trouble sleeping after taking it, take the second dose several hours before bedtime. If you are taking the syrup, measure the dose carefully with a medication spoon/cup. Dosage is based on your medical condition and response to therapy. In children, the dosage is also based on body weight. Do not take more than prescribed by your doctor. This medication works best when the amount of medicine in your body is kept at a constant level. Therefore, take this medication at evenly spaced intervals throughout the day and night. If you are taking amantadine for a viral infection, begin taking it as soon as possible. Continue taking it until the full prescribed amount is finished, even if symptoms disappear after a few days. Stopping the medication too early may result in a relapse of the infection. In Parkinson's disease, the effects of the medication may not be noticed for several weeks. Do not suddenly stop taking the medication because symptoms or side effects may worsen. Your doctor may want to reduce your dose gradually. This medication may not work as well after it has been taken for several months. Tell your doctor if this medication stops working well. SIDE EFFECTS: Blurred vision, nausea, stomach upset, drowsiness, dizziness, headache, dry mouth, constipation, nervousness, or trouble sleeping may occur. If any of these effects persist or worsen, notify your doctor or pharmacist promptly. Remember that your doctor has prescribed this medication because he or she has judged that the benefit to you is greater than the risk of side effects. Many people using this medication do not have serious side effects. Tell your doctor immediately if any of these unlikely but serious side effects occur: purplish-red blotchy spots on the skin, swelling of the ankles/feet, difficulty urinating, vision changes. Tell your doctor immediately if any of these rare but very serious side effects occur: shortness of breath, mental/mood changes (such as depression, suicidal thoughts/attempts, compulsive behavior including urge to gamble), muscle stiffness, uncontrolled muscle movements, unusual sweating, fast heartbeat, unexplained fever, seizures. A very serious allergic reaction to this drug is unlikely, but seek immediate medical attention if it occurs. Symptoms of a serious allergic reaction may include: rash, itching/swelling (especially of the face/tongue/throat), severe dizziness, trouble breathing. This is not a complete list of possible side effects. If you notice other effects not listed above, contact your doctor or pharmacist. In the US - Call your doctor for medical advice about side effects. You may report side effects to FDA at 1-800-FDA-1088. In Canada - Call your doctor for medical advice about side effects. You may report side effects to Health Canada at 1-866-234-2345. PRECAUTIONS: Before taking amantadine, tell your doctor or pharmacist if you are allergic to it; or to rimantadine; or if you have any other allergies. This product may contain inactive ingredients, which can cause allergic reactions or other problems. Talk to your pharmacist for more details. This medication should not be used if you have certain medical conditions. Before using this medicine, consult your doctor or pharmacist if you have: a certain type of eye disease (untreated closed-angle glaucoma). Before using this medication, tell your doctor or pharmacist your medical history, especially of: swelling of arms/legs (peripheral edema), heart problems (e.g., congestive heart failure), blood pressure problems (e.g., dizziness when standing), kidney disease, liver disease, mental/mood conditions (e.g., depression, psychosis), seizures, a certain skin condition (eczematoid dermatitis). This drug may make you dizzy or drowsy or cause blurred vision. Do not drive, use machinery, or do any activity that requires alertness or clear vision until you are sure you can perform such activities safely. Avoid alcoholic beverages. To minimize dizziness and lightheadedness, get up slowly when rising from a seated or lying position. If you are taking this medication for Parkinson's disease, be careful not to overdo physical activity as your condition improves because this may increase your risk of falls. Consult your doctor about a plan to gradually increase your physical activity as symptoms improve. Kidney function declines as you grow older. This medication is removed by the kidneys. Therefore, elderly people may be at a greater risk for side effects while taking this drug. This medication should be used during pregnancy only if clearly needed. There are rare reports of heart defects in newborns whose mothers took amantadine during pregnancy. Discuss the risks and benefits with your doctor. This drug passes into breast milk and may have undesirable effects on a nursing infant. Consult with your doctor before breast-feeding. DRUG INTERACTIONS: Your healthcare professionals (e.g., doctor or pharmacist) may already be aware of any possible drug interactions and may be monitoring you for it. Do not start, stop or change the dosage of any medicine before checking with them first. This drug should not be used with the following medication because a very serious interaction may occur: flu vaccine inhaled through the nose. If you are currently using the medication listed above, tell your doctor or pharmacist before starting amantadine. Before using this medication, tell your doctor or pharmacist of all prescription and nonprescription/herbal products you may use, especially of: anticholinergics (e.g., atropine), antihistamines (e.g., diphenhydramine), certain psychiatric medicines (phenothiazines such as thioridazine), quinidine, quinine, stimulants (like caffeine and decongestants commonly found in cough-and-cold products), triamterene/hydrochlorothiazide, trimethoprim/sulfamethoxazole. This document does not contain all possible interactions. Therefore, before using this product, tell your doctor or pharmacist of all the products you use. Keep a list of all your medications with you, and share the list with your doctor and pharmacist. OVERDOSE: If overdose is suspected, contact your local poison control center or emergency room immediately. US residents can call the US national poison hotline at 1-800-222-1222. Canadian residents should call their local poison control center directly. Symptoms of overdose may include fast/irregular heartbeats, severe drowsiness, shortness of breath, change in the amount of urine, mental/mood changes (e.g., anxiety, aggression, confusion, hallucinations), seizures. NOTES: Do not share this product with others. People with Parkinson's disease may have an increased risk for developing skin cancer (melanoma). If you are taking this drug to treat Parkinson's disease, tell your doctor promptly if you notice a change in the appearance or size of moles or other unusual skin changes. Ask your doctor if you should have regular skin exams.